Chanel Chance Eau Fraiche is a floral fragrance, fresh like a summer breeze. 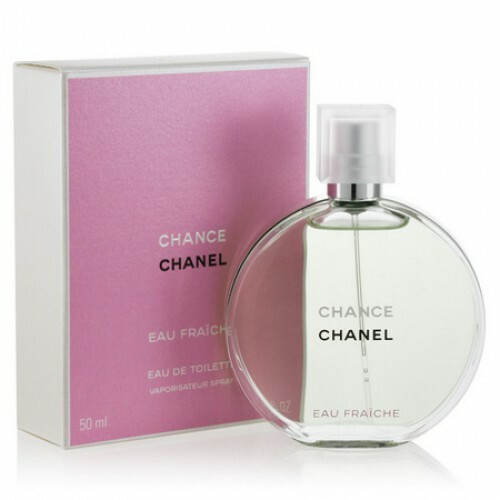 Chanel Chance Eau Fraiche 100ml. Eau De Toilette is a floral fragrance for women, fresh like a summer breeze. The fragrance was launched in 2007 and is a fragrance with fresh aromas of flowers and essences of watermelon. One of the main ingredients in the product composition is jasmine which gives a unique flavor and delicate. Chanel Chance Eau Fraiche can be used any time of the day and is perfect for a hot summer day that fails to refresh all your senses. Perfume bottle has a unique design that highlights the fresh color of the product. Chanel Chance Eau Fraiche is the right fragrance of a woman who wants secure herself a fresh and great flavor! Perfume performed in full compliance with the original recipes, using only the highest quality components. Can say with confidence that distinguish quality perfumes "Lux" from the original perfume can only highly skilled, and then, perhaps, not always. original fragrance Chance fantastically turned into a lighter and more sparkling freshness, summer version in the form of toilet water Chance Eau Fraiche. New unexpectedly and interestingly revealed floral-fruity burst of juicy citrus, water hyacinth and jasmine absolutes pushed to the forefront. "heart" of the bright flash power dips a little and slowly envelops wood and soothing warmth of amber, patchouli and teakwood, leaving a loop softness and tenderness vetiver and white musk. Gender: Female Year: 2007 Family: Floral, chypre.